I was a little young to appreciate importance of the Lenny Kaye-collated Nuggets compilation when it was released in 1972. But a few years later, when punk hit, and everyone was talking about how influential the collection had been, I understood. There is just no denying “Psychotic Reaction” by The Count Five, “Dirty Water“ by The Standells, and the opening track, “I Had Too Much To Dream (Last Night)” by the Electric Prunes. For most people I imagine that these classic songs were where our interests began and ended in terms of the individual bands. But in the case of the Electric Prunes, there was a hell of a lot more to come in their career over the next few years, we just never heard about it. Thanks to the Real Gone label’s new Electric Prunes compilation, The Complete Reprise Singles, we are privy to whole Prunes story, and it is a fascinating one. I had never heard another track by them besides “I Had Too Much To Dream,” and assumed that they (like so many others), had simply disbanded after their hit. As The Complete Reprise Singles collection shows, they actually released 11 singles over the years 1966-1969. I had never even heard their “other” hit “Get Me To The World On Time” (1967), let alone their “letter” to Nixon, “Hey Mr. President” (1969). As Richie Unterberger says in his liner notes, these singles “Act as almost a snapshot of the evolution of psychedelic music during the period.” The 23 songs here (plus a hilarious “Vox Wah Wah Radio Spot”) really do reflect an AM radio vision of what was going on in music. No side-long epics like Iron Butterfly’s “In-A-Gadda-Da-Vida” for these cats. The three-minute 45-rpm single was where it was at. One of the biggest revelations is that they basically disbanded in all but name over that three year period. The Complete Reprise Singles is presented chronologically, and their first single “Ain’t It Hard” b/w “Little Olive” opens the set. It was a flop, but their next was “I Had Too Much To Dream (Last Night)“ b/w “Luvin” in 1967. The lineup of the band was Jim Lowe (vocals), James "Weasel" Spagnola and Ken Williams (guitars), Mark Tulin (bass) and Preston Ritter (drums). The aforementioned “Get Me To The World On Time” b/w “Are You Lovin’ Me More (But Enjoying It Less)” rose to number 27 on the charts, and that was the end of the “hits” for the Prunes. Both singles were from their self-titled 1967 debut album. From what I have gathered, it is the second Electric Prunes album, titled Underground which is considered their shining moment. Although I have never heard the album, the tracks included here are the highlights of the set for me. The songs constitute three singles; “Dr. Do-Good” b/w “Hideaway,” and the absolutely hilarious “The Great Banana Hoax” b/w “Wind-Up Toys” are from Underground. The oddity is a non-LP single, “Everybody Knows (You’re Not In Love)” b/w “You’ve Never Had It Better,” which came from the Underground sessions, but was not included on the album. Those two tunes were added as bonus tracks for the CD reissue of Underground many years later. As you can see, things were already getting a bit haphazard in Prune-land, and it just got weirder and weirder. Album number three was Mass in F Minor (1968). At this point, only Lowe and Tulin remained from the original “I Had Too Much To Dream” lineup. In some bizarre record-biz shenanigans, their producer’s manager actually owned the name “Electric Prunes.” So he had the power to hire and fire members of the “band” at will. By the time of the final Just Good Old Rock and Roll (1969), not a single member of the group that recorded “I Had Too Much To Dream” remained. As weird as the situation was, the later material with the “replacement” Prunes is actually pretty good. “Violent Rose” has a very Donovan “Sunshine Superman” feel, while its B-side “Sell” grooves in a Steppenwolf vein. “Love Grows” is not the one “where my Rosemary goes," rather it reminds me a lot of the Grateful Dead’s “Truckin.” The B-side of that final Electric Prunes Reprise single was “Finders Keepers, Losers Weepers,” and could have slotted right in on the Shades of Deep Purple album. 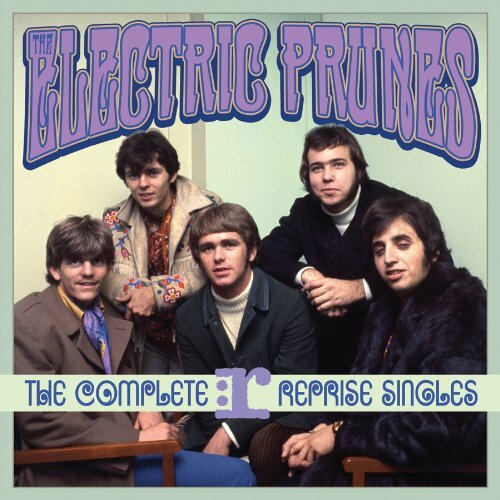 In retrospect, releasing this later material under the name Electric Prunes was probably a big mistake. The garage-band teens who signed outrageous contracts but came up with a classic song in “I Had Too Much To Dream (Last Night)” certainly got screwed. But in a way, so did their exploiters. Many of these later “Electric Prunes” songs are really good, and might have had a chance if the (by 1969) “toxic” name of the Electric Prunes had not been used for what was basically an anonymous studio band concoction. As I previously mentioned, there were 11 singles released by the Electric Prunes, yet there are 24 tracks here. Cut 24 is the 1:02 “Vox Wah Wah Pedal Radio Spot.“ So that accounts for 23. So how did they come up with 24? Chalk it up to more wacky management decisions. The song “Shadows” is included, which was a promo-only, one-sided single released to radio, from a 1968 film titled The Name of the Game is Kill. The fact that it is among the finest songs of the set is almost too perfect. There is quite a bit of great music contained here. And knowing the history of the group, and all of the weirdness that went on behind the scenes just makes it that much more intriguing. The Complete Reprise Singles is a very cool collection, and well worth checking out.